Stepping into the gargantuan ITC Grand Chola, it is just a matter of minutes before Chef Lambert Chiang whisks me away into his nest, the Pan Asian. Having taken over from Chef Vikramjeet Roy three months ago, Chiang has been quick to prove his mettle with subtle but charming tweaks in the menu. 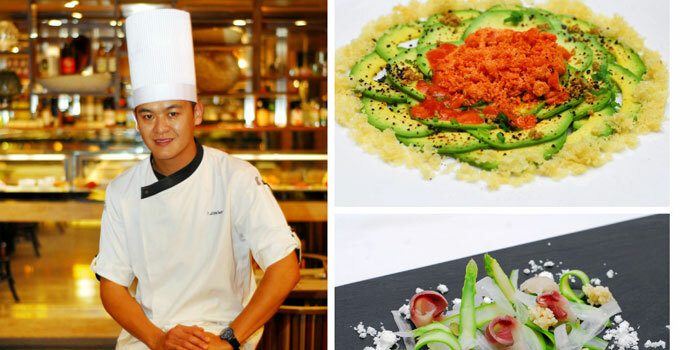 This 29-year-old from Shillong found his calling early with his parentsa�� soulful Chinese restaurant up in the hills where he grew up. Handpicked by Maurya Delhi in 2008, and subsequently having worked alongside Chef Royin in 2012, he helped set up the brand Pan Asian in the city. When quizzed about changes to the menu, he informs, a�?Ia��m trying to focus on the overall dining experience by involving the diner more with his food.a�? Starting with diners now using pipettes of the Mango and Chilli sauce that accompanies the acclaimed Thai Fish Cakes, to the chefa��s degustation menu. 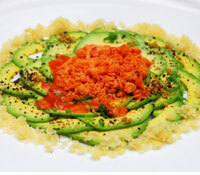 It takes you beyond the a la carte offerings and introduces you to some delectable creations put together personally by Chianga��like the avocado Carccio, centred with a light tomato snow along with tempura crumb and tangy Yuzu soya. 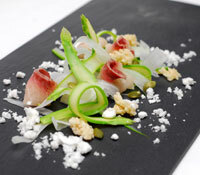 Better still is the refreshing Daikon and Asparagus Tagliatelle salada��a visual treat with the juicy veggies resembling strips of pasta, combined with a savoury white miso dressing, crunchy puffed rice and melon seeds. While meat lovers will vouch for the sticky succulent pork ribs served with a variety of accompaniments like feta stuffed olives, poached pears and more, the vegetarians can find solace in Crispy Lotus stema��crunchy and tender, served with a black pepper crumble and rich plum sauce. Getting chatty on the trends that have made an impact on the global diner in 2014, the chef says, a�?Small portions, more variety and healthy cooking techniques like sous-vide were the norm, but it was the chefa��s tasting menus and personalised meal experiences that hit the spot.a�? What about 2015? a�?I think ita��s time for chefs to experiment and not be leery of innovation. Whether it is compressed fruits or freeze drying to enhance flavour, the illusion of ingredients in various forms will become intriguing to the diner.a�? Meanwhile, from the chefa��s kitchen, expect spaghetti made of lobster and tofu or carbonated soups using his Siphon Gun for the coming year.